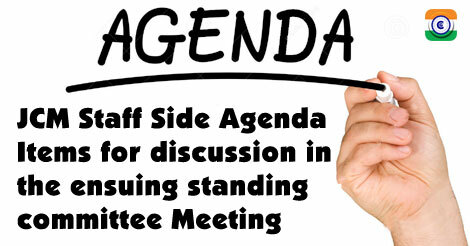 Sub: JCM (Staff Side) Agenda Items for discussion in the ensuing standing committee Meeting - reg. 1. To formulate a policy for direct appointment of Trained Trade Apprentices of Central Government Industrial Establishments like Railways, Defence etc. as per the amended provisions of section-22 of Apprentice Act 1961. The Government of India amended the Apprentice Act 1961 as Apprentices (Amended) Act, 2014 (No.29 of 2014) dated 5th December,2014 incorporating the following provision in Section-22 of the principal Act. Section-22: "Every employer shall formulate its own policy for recruiting any apprentice who has completed the period of apprenticeship training in his Establishment". It was agreed in the Central Apprenticeship council meeting under the Chairmanship of Minister of State (IC) for Labour & Employment on 8th April,2015 that M/o Labour will frame the guidelines for Govt. Industrial Establishments & PSUs for recruitment of Apprentices after completion of training, on the suggestion of Union representatives. Hence the Apprentices selected through entrance examinations etc., are facing undue hardships in getting the appointment when recruitment takes place in the establishment where they were trained. Therefore it was proposed that Govt. of India, as Employer, will formulate the following policy for recruitment of Trained Trade Apprentices. 1. All Apprentice training institutes under Government Industrial Establishments shall maintain the seniority list of Ex-Trade apprentices in respective trades. 2. The Apprentices trained in the earlier batch will be enbloc senior to the apprentices of the subsequent batches. 3. While maintaining the batch-wise seniority, marks/grading obtained in NAC examination conducted by NCVT will be the criteria for determining intra-batch seniority of the apprentices. 4. In case the marks/grading is identical for two or more individuals, the date of birth should be the criteria for deciding the seniority. As and when sanction is accorded for making recruitment in the skilled grade of various trades Ex-Trade Apprentices of respective Government Industrial Establishments will be considered for such recruitment in the relevant Trade. The above draft policy proposed by the staff side is requested to be considered favourably by the Government for implementation. 2. Revision of the benefit of Deposit linked Insurance coverage from GPF. As per Rule 33-B of GPF Rules on the death of a subscriber an additional amount not exceeding Rs.60,000/- payable under Deposit linked insurance scheme of GPF to the dependents of a deceased employee. This rate has not been enhanced for so many years. Similar benefit for a depositor in EPF covered under the Employees Deposit Linked Insurance Scheme 1976 is enhanced to Rs.6,00,000/-. It is therefore requested that government may consider to enhance the limit of Deposit Linked Insurance Scheme from GPF. 3. Implementation of the recommendation of 6th CPC with regard to Limited Departmental competitive Examination for post in Group B and Group C.
As per the 6th CPC recommendation in para 6.1.7, the employee in PB-1 with GP Rs.1800/- will be eligible to appear in LDCE for a post in PB-2 with GP Rs.4800/- provided he/she possesses the necessary qualification. After 6th CPC recommendation, the number of employees in GP Rs.1800/- have acquired higher qualifications & became eligible for higher post but are not being allowed to apply for the higher post through LDCE, since the above recommendation of 6th CPC has not yet been implemented by the government. In view of the changed circumstances, those employees in GP Rs.1800/- who have acquired the higher qualifications, their initiative & interest be considered & the Government may kindly implement the recommendation of 6th CPC. 4. Endorsement of Higher Education not mentioned in the PVR Forms in the Service Record of the Employees. In column 10 of PVR (Attestation Form) i.e. Educational Qualifications, the candidates used to fill this column with minimum qualification for the post for which they are selected for appointment, due to the insufficient space in the column. However, after appointment, when they apply for endorsing their higher qualifications in the service Record, the Administration issues ‘ show Cause Notice’ to them for not disclosing their Educational qualification in the Attestation Form. Since this information was not given by them due to the insufficient space in the column of attestation Form, the eventuality may not be treated as hiding the information & hence, it is requested that DOP&T may issue instructions to endorse the higher qualification in the Service Record of employees, even if it was mentioned in the PVR Form. 5. Restoration of the Advances withdrawn by the 7th CPC. The Government has accepted the recommendation of 7th CPC to withdraw (i) Natural calamity advance (ii) Festival Advance (iii) LTC and TA advances (iv) Medical advance (V) Education advance & (f) vehicle advances including cycle advance. This has resulted undue hardships to the Government Employees. Since the advances are recovered in monthly instalments from employees, it is requested that Government may restore these advances as a welfare measure. 6. MACP to the employees who have completed 10 years or 20/30 years on the date of their retirement. The employees who have completed 10 years in the same grade/pay level or those who have completed 20/30 years on the last working day of the month which happens to be the superannuation/retirement day of the concerned employee, are denied MACP benefit on the pretext that they are eligible for MACP only on the next working day. Since the concerned employee retired one day before the denial of benefit. he is subjected to huge loss in pension & other terminal benefits. In view of the above it is requested that the employees who have completed 10 years or 20/30 years on the date of their retirement may be granted MACP benefit on the last working day relaxing the relevant provisions in the MACP Scheme. 7. Payment of equal pay to equal work to the workers/employees engaged in all Govt. Offices either through contractors or directly as daily rated/contingent/casual workers as per the direction of the Supreme court. Hon'ble supreme court delivered a judgement in the civil appeal No.213 of 2013 in the case of State of punjab Vs.jagjit singh and others citing the obligation of the Government of India to abide by the International covenant on Economic, social and cultural rights, 1966 to which the central government is a signatory. Quoting the provisions under Article 7 of the covenant viz. (a) Remuneration which provides all workers as a minimum wages & equal remuneration for equal work (b) Safe and healthy working conditions; (c) Equal opportunities for everyone to be promoted in his employment to an appropriate higher level, subject to no consideration other than those of seniority and competence & (d) Rest, leisure and reasonable limitation of working hours and periodical holidays with pay as well as remuneration for public holidays and various previous rulings and judgements of the Court under Article 141 of the constitution, Hon'ble supreme Court directed the State of Punjab to provide equal pay for equal work to all daily wage employees, ad-hoc appointees, employees appointed on casual basis, contractual employees and the like. concludingly, Court has decided that all such employees are entitled for wages at the minimum of the pay scale. Staff Side therefore requests the Government to issue explicit instructions that the employees/workers engaged on casual/contingent/temporary/daily rated basis including those through contractors are given the rate of the minimum of the lowest pay scale and a scheme for regularization of such appointees is drawn so that these employees would be absorbed as permanent workers over a period of time. 8. Revision of Ex-gratin to CPF/SRPF retirees. Taking into account the fact that pay and pension were revised on the basis of the 7th CPC's recommendation, a revision of rates of the ex-gratia to the CPF/SRPF retirees whose number is dwindling every day is warranted. Staff Side therefore requests that the rates may be appropriately revised applying the very same rationale adopted in the case of civil pensioners. 9. Dispense with the practice of ignoring the fraction while computing the Dearness Allowance. For the sake of easy computation of DA the practice of ignoring the fraction was initiated. The quantum loss to the beneficiaries in the beginning was meager. Now that the administrative difficulties which prompted for ignoring the fraction has been greatly eased due to computerization and taking into account the loss for six months is no more meager, it is necessary that the practice is dispensed with. For example, the next instalment of DA is likely to be 2.95% whereas the orders would be issued for grant of only 2%. In the case of an employee, whose basic pay is Rs.50,000, the loss per month in that case would be Rs.475/-. It is pertinent to mention in this connection that in the case of Bank employees, the practice of ignoring the fraction is not followed. Staff Side therefore requests that the DA hereafter be computed without ignoring the fraction. 10. Include unmarried/widow/divorcee sister in the definition of family for family pension. The scope of Family pension under Rule 52 of the CCS (Pension) Rules, 1972 was extended to the dependent disabled siblings (brother and sister) of Central Government servant/pensioners vide DOP&PW 0.1. No.1/15/2008-P&PW(E) dated 17th August, 2009. There are cases wherein an employee/pensioner remains unmarried and leaves behind dependent unmarried/widow/divorcee sister/sisters. Though cases of such types may be few and far between, nonetheless, such hapless ladies need to be taken care by the Government lest they should be left to fend for themselves, after the death of Government Servant/pensioner on whom they were fully dependent before his/her death. We request to include dependent unmarried/widow/divorcee sister/sisters in the definition of family for the purpose of family pension. 11. Removal of conditions of being at the "Headquarters" for a few days in a month to claim the Transport Allowance. In regard to the grant of Transport Allowance to Government Employees it was pointed out that in many organizations viz. Central Ground Water Board, Survey of India, Geological Survey of India, Indian Bureau of Mines, Postal workers and Indian Audit and Accounts Department etc., the employees are required to be in field formations on duty for months together. Because of the condition stipulated that the employees must be at the Headquarters for certain number of days in a month, many of them are denied transport allowance as the exigencies of work entrusted to them make them to be away from liquors for months together. The denial is, therefore, a double punishment in as much they are to be away from their family and also are asked to bear the financial loss due to the denial of transport allowance. This apart, once the Transport allowance is denied they automatically do not become entitled for City Compensatory allowance also. Staff Side therefore requests that this condition may be removed for the grant of Transport Allowance. 12. Transport allowance in the case of Physically handicapped person at the double rate and deduction of the same if one is on short leave. To be dispensed with. Transport allowance is admissible for physically handicapped persons at the double the rates as per the extant instructions on the subject. This is provided for the reason that the physically handicapped person has to take the help of another person to travel and reach the office. However, if the physically handicapped person is on leave (EL, HPL etc.) proportionate amount of transport allowance pertaining to the helper is deducted. Normally transport allowance is denied only when a person is on Earned leave for a period exceeding one month. There appears to be no rationale to deduct the proportionate amount of transport allowance pertaining to the helper in the case of physically handicapped person. Either a clarification may be issued to dispense with the practice if the same has been initiated by the Zonal Accounts Officers on an interpretation of the rules. If the pertinent rule itself has to be amended, the same may be done as no helper can be asked that he must suffer and sacrifice the allowance because the physically handicapped persons for some domestic reason could not go to office on a particular day in a month. 13. Counting full service of Temporary Casual Labourers for pensionary and retirement benefits in Railways - reg. The Staff Side had discussed its demand for counting full service of temporary status of casual labourers for pensionary and retirement benefits at the level of Railway Ministry. Consequently, the Railway Ministry had agreed and accordingly proposal was sent to the Ministry of Finance and DoP&T seeking clearance. Unfortunately, the MoF/DoP&T have not accorded approval. (b) The Railway Administrations have however taken abnormally long periods to absorb them as regular staff although regular posts were vacant. (e) The SLPs filed by the Union of India before the Apex Court in a few cases of casual labourers were dismissed and the Hon'ble Supreme Court had directed the Union of India to calculate Pension and other retrial benefits payable to the retiring/retired employees, taking into account the 100% temporary status service. Staff Side therefore requests to consider the above valid points and accord approval for counting total temporary status service of Casual Labourers for pensionary benefits in Railways. 14. Ensure Parity in Pay Scale of All Stenographers, Assistants and Ministerial Staff in Subordinate Offices and in IA&AD & Organized Accounts Cadres with Central Secretariat Staff by upgrading their Pay Scales. The question of parity, as has been rightly pointed out by 7th CPC, is a settled matter. It is the Department of Personnel which is the Cadre Controlling department of Central Secretariat Cadre that unsettle the parity every time. What is required is to grant higher pay scale at par with Ministerial and Stenographer cadres of Central Secretariat and the similarly placed cadres in the field and subordinate offices and lA&AD & Organized Accounts cadre. 15. Counting of Pre-appointment induction training period as qualifying service for grant of financial up-gradation under MACP Scheme. As per MAP orders "service rendered on ad-hoc contract basis before regular appointment on pre appointment training shall not be taken into reckoning as qualifying service for financial up-gradation under MACPS". It is requested that pre-appointment induction training period followed by regular appointment may be reckoned as qualifying service for grant of MACP, as it is already counted as qualifying service for the purpose of increment. 16. Enhancement of Bonus Ceiling Limit of Casual Labourers consequent on enhancement of Bonus Calculation Ceiling of Central Government Employees. At present, casual labourers are paid Rs,12001- as maximum bonus. This amount was fixed when the bonus calculation ceiling of Central Government employees was enhanced to Rs.35001-. As the bonus calculation ceiling of Central Government employees is enhanced to Rs.7000/-, it is requested that the ceiling of casual labourers may also be enhanced. 17. Grant of Corresponding 7th CPC Pay Scale to those officials who are appointed on compassionate grounds and drawing pre-revised pay )with out grade pay) for want of matriculation qualification. As per DOP&T orders, those compassionate appointment candidates who do not posses 10th Standard qualification are to be appointed in the minimum pay scale (without grade pay) till they acquire 10th standard qualification. The minimum pay of such candidates fixed as per 6th CPC pay scale is yet to be revised. Action may be taken to revise the minimum pay as per 7th CPC recommendations. 18. Implementation of 7th CPC recommendations - Upward revision of pay scales of various categories. The VII CPC has recommended up-graded pay scales to certain specific categories of the Railway Staff, but regrettably the matter stands referred to the DOP&T (GOI), for taking a comprehensive view in the matter. It may be appreciated that, 7th CPC has recommended above mentioned upgrade pay scales to these categories of staff after examining in detail their recruitment qualifications, nature of duties and vertical and horizontal relativity, while these recommendations of 7th CPC should have been implemented by the Ministry of Railways without any reference to DOP&T (GOI), but the same were referred to DOP&T for taking a view. since sufficient time has already been elapsed, it is urged that, necessary reply of the DOP&T in regard to the above should be communicated to the Ministry of Railways, so that these recommendations of 7th CPC are implemented in the Railways without any further delay. 19. Acute shortage of doctors in the Railways - Failure of the UPSC to send doctors in the Railways. The patients visiting to Railway Hospitals and dispensaries are a dejected lot as there is acute shortage of staff and doctors. The hospitals and dispensaries are running inadequate strength of doctors against the sanctioned strength. Railway hospitals have a barren look as the treatment centre, meant for providing medical service to departmental staff and their family members, miserably fails to serve its purpose due to acute shortage of doctors. The situation is worsening day by day. As against the large number of doctors recruited through UPSC for the Indian Railways, only a few are joining for the reason that they are not getting their choice place of posting. They are also not able to do their higher studies for which they often leave their jobs. Govt, of India should formulate policy in this regard. UPSC should also recruit specialist Doctors as per policy for the Indian Railways for up-gradation of health services over the Indian Railways. Possibilities should also be explored by the Government to have their dedicated Medical colleges on the Indian Railways, so that after training they could be retained for the Railways as is being done by the AFMC, Pune. 20. Implementation of pay scales recommended by the VII CPC in case of several common categories. The 7th CPC in Chapter 7.7 of its recommendations have recommended specific pay scales for certain "Common Categories". Pay Scale recommended for Medical Laboratory Staff have been specifically dealt under Para 7.7.25 to 7.7.30 of 7th CPC Report. Government of India have already accepted these recommendations of the VII CPC and the same are to be implemented by the Ministry of Railways (Railway Board). There appears to be some confusion prevailing on this issue in regard to implementation of these recommendations of the VII CPC in respect of Medical Laboratory Staff. staff Side, therefore, desires that the pay scales and nomenclature of the revised posts of Medical Laboratory Staff, as recommended by the VII CPC under Para 7.7.29 of Chapter VII, be implemented w.e.f 1.1.2016 with all Consequential benefits as deep sense of frustration is prevailing among these staff who are fully engaged in pathological investigation of the railway patients for their proper diagnosis. 21. Recommendations of the VII CPC on the Allowances. i) The VII CPC under Para 11.40.50 (Page No.738 of the report) has recommended special train controllers allowance of Rs.5,000 p.m. to the Train Controllers. iii) Special Running Staff Allowance (Para 11.40.62, Page No.740 of the VII CPC Report). Guard (Passenger) Rs. 750 p.m.
As per VII CPC report, Dearness Allowance will be payable on this allowance. This allowance also be extended to Loco shunter, guard (Goods) and Asstt. Loco pilot. Additional Allowance, so paid to Running Staff,be counted for the purpose of pensionary benefits. Affiliates are advised to circulate the above issues among cadres and also convey inpurs on each item which may be useful for discussion in the standing committee meeting of NC/JCM.